I recently wrote a script that posts bookmarks from Yojimbo to Pinboard. Now that I have a nice system for posting links, I find that I’d like even more integration. For instance, I’d like to be able to keep Yojimbo in sync by downloading any links I post to Pinboard via other interfaces. The Pinboard/Delicious API provides a variety of methods for retrieving link information, but there isn’t a straightforward way to parse the results in AppleScript. In my posting script, I just search the response for code="done". This is sufficient to tell if the add method succeeded, but methods that return more detailed information need more rigorous handling. 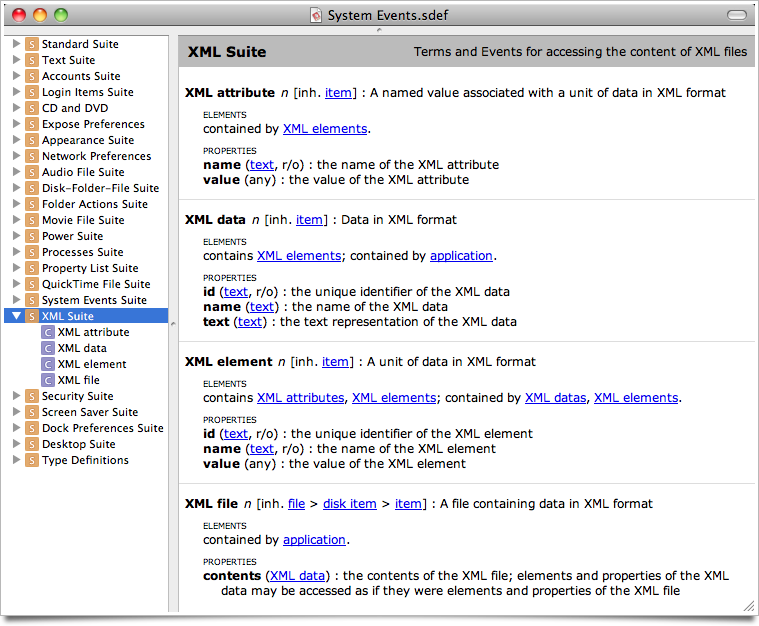 Incidentally, AppleScript supports direct interaction with SOAP or XML-RPC web services; see the documentation here. However, the Pinboard API uses a different architecture, REST (sort of). Essentially, a query is represented as a URL, with parameters, and the XML results are returned by the server like the content of any other web page. (I use do shell script and curl to make the request and get the raw results; I don’t know if there is a better AppleScript idiom for general HTTP transactions. URL Access Scripting is dusty and requires writing temporary files.) The task is to extract the relevant bookmark information from the response. 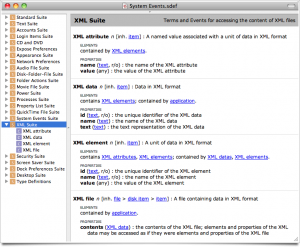 As it turns out, the System Events scripting dictionary includes an XML suite, pictured above. Some experiments based on the examples given in this discussion at MacScripter confirm that it can be used to parse data returned by the Pinboard API. So, all the pieces necessary to implement a more sophisticated AppleScript bookmark syncing system are available. Posted on Saturday, February 20th, 2010. Tags: applescript, code, mac, pinboard.